Limited places are available for veterinarians to participate in two outreach programs, sponsored by WSAVA’s Animal Wellness & Welfare Committee (AWWC) in the weeks before & after the 2018 WSAVA World Congress in Singapore. With Blue Paw Trust, volunteers will be involved in delivering veterinary services, including spay/neuter surgeries & rabies vaccinations in underserved communities around Colombo, the capital of Sri Lanka. 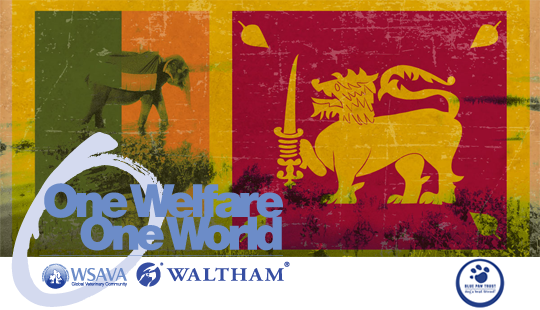 The Blue Paw Trust (BPT) is dedicated to eliminating rabies from Sri Lanka, & works with the national government of Sri Lanka to implement the national rabies elimination strategy. At local government level BPT implement holistic rabies control projects which include sterilization and vaccination programs for dogs mainly in impoverished communities. The experience requires volunteers to travel to Colombo, Sri Lanka. BPT welcomes volunteer veterinarians who wish to learn about assisting animals in underserved communities, and offer their time and compassion towards improving the health and well-being of people and dogs (pets as well as roaming dogs). More information, included estimated costs, is available in the outreach brochure. Through this outreach program, WSAVA continues its aim of promoting a global veterinary community, bringing together veterinarians from different countries to advance the quality and availability of small animal medicine and surgery worldwide.